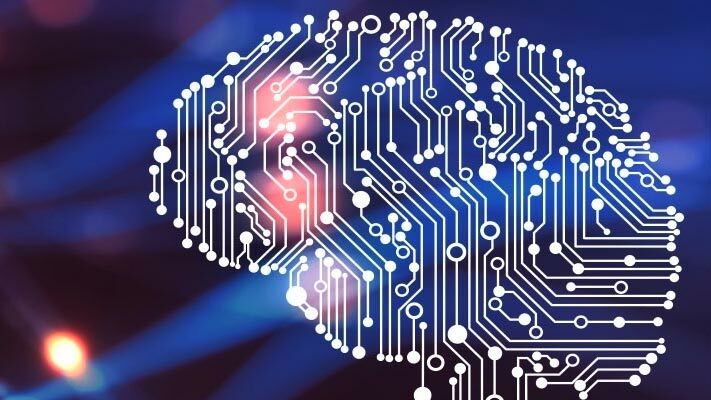 A latent Dirichlet allocation (LDA) model is a topic model which discovers underlying topics in a collection of documents and infers word probabilities in topics. If the model was fit using a bag-of-n-grams model, then the software treats the n-grams as individual words. mdl = fitlda(bag,numTopics) fits an LDA model with numTopics topics to the bag-of-words or bag-of-n-grams model bag. mdl = fitlda(counts,numTopics) fits an LDA model to the documents represented by a matrix of frequency counts. mdl = fitlda(___,Name,Value) specifies additional options using one or more name-value pair arguments. Fit an LDA model with four topics. Initial topic assignments sampled in 0.143778 seconds. 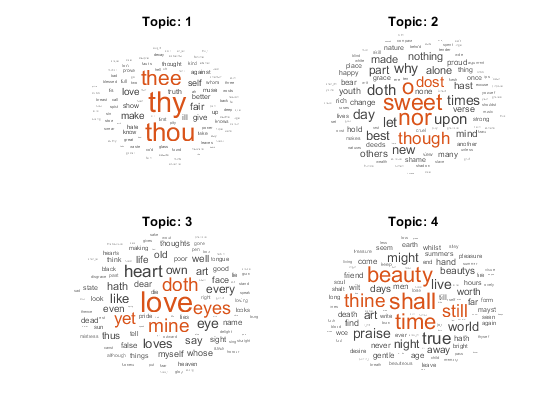 Visualize the topics using word clouds. Fit an LDA model to a collection of documents represented by a word count matrix. To reproduce the results of this example, set rng to 'default'. Load the example data. sonnetsCounts.mat contains a matrix of word counts and a corresponding vocabulary of preprocessed versions of Shakespeare's sonnets. The value counts(i,j) corresponds to the number of times the jth word of the vocabulary appears in the ith document. Fit an LDA model with 7 topics. To suppress the verbose output, set 'Verbose' to 0. Visualize multiple topic mixtures using stacked bar charts. Visualize the topic mixtures of the first three input documents. Fit an LDA model with 20 topics. Initial topic assignments sampled in 0.208291 seconds. Predict the top topics for an array of new documents. 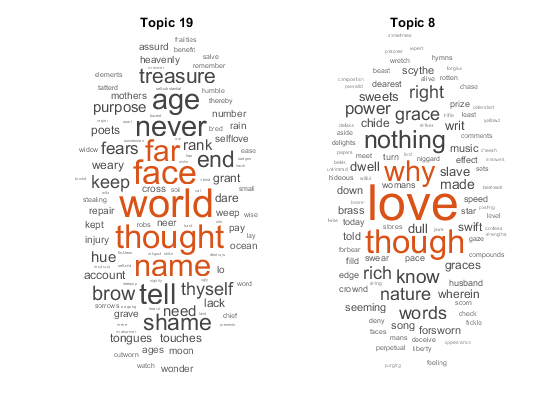 Visualize the predicted topics using word clouds. Number of topics, specified as a positive integer. For an example showing how to choose the number of topics, see Choose Number of Topics for LDA Model. Frequency counts of words, specified as a matrix of nonnegative integers. If you specify 'DocumentsIn' to be 'rows', then the value counts(i,j) corresponds to the number of times the jth word of the vocabulary appears in the ith document. Otherwise, the value counts(i,j) corresponds to the number of times the ith word of the vocabulary appears in the jth document. Example: 'Solver','avb' specifies to use approximate variational Bayes as the solver. 'savb' – Use stochastic approximate variational Bayes  . This solver is best suited for large datasets and can fit a good model in fewer passes of the data. 'cgs' – Use collapsed Gibbs sampling . This solver can be more accurate at the cost of taking longer to run. The resume function does not support models fitted with CGS. 'avb' – Use approximate variational Bayes . This solver typically runs more quickly than collapsed Gibbs sampling and collapsed variational Bayes, but can be less accurate. 'cvb0' – Use collapsed variational Bayes, zeroth order  . This solver can be more accurate than approximate variational Bayes at the cost of taking longer to run. For an example showing how to compare solvers, see Compare LDA Solvers. Relative tolerance on log-likelihood, specified as the comma-separated pair consisting of 'LogLikelihoodTolerance' and a positive scalar. The optimization terminates when this tolerance is reached. Option for fitting topic concentration, specified as the comma-separated pair consisting of 'FitTopicConcentration' and either true or false. The function fits the Dirichlet prior α=α0(p1p2⋯pK) on the topic mixtures, where α0 is the topic concentration and p1,…,pK are the corpus topic probabilities which sum to 1. For batch the solvers 'cgs', 'avb', and 'cvb0', the default for FitTopicConcentration is true. For the stochastic solver 'savb', the default is false. Initial estimate of the topic concentration, specified as the comma-separated pair consisting of 'InitialTopicConcentration' and a nonnegative scalar. The function sets the concentration per topic to TopicConcentration/NumTopics. For more information, see Latent Dirichlet Allocation. 'initial-fit-probability' – Sort the topics by the corpus topic probabilities of input document set (the CorpusTopicProbabilities property). 'unordered' – Do not sort the topics. Word concentration, specified as the comma-separated pair consisting of 'WordConcentration' and a nonnegative scalar. The software sets the Dirichlet prior on the topics (the word probabilities per topic) to be the symmetric Dirichlet distribution parameter with the value WordConcentration/numWords, where numWords is the vocabulary size of the input documents. For more information, see Latent Dirichlet Allocation. 'rows' – Input is a matrix of word counts with rows corresponding to documents. 'columns' – Input is a transposed matrix of word counts with columns corresponding to documents. This option only applies if you specify the input documents as a matrix of word counts. If you orient your word count matrix so that documents correspond to columns and specify 'DocumentsIn','columns', then you might experience a significant reduction in optimization-execution time. Maximum number of iterations, specified as the comma-separated pair consisting of 'IterationLimit' and a positive integer. This option supports batch solvers only ('cgs', 'avb', or 'cvb0'). Maximum number of passes through the data, specified as the comma-separated pair consisting of 'DataPassLimit' and a positive integer. If you specify 'DataPassLimit' but not 'MiniBatchLimit', then the default value of 'MiniBatchLimit' is ignored. If you specify both 'DataPassLimit' and 'MiniBatchLimit', then fitlda uses the argument that results in processing the fewest observations. This option supports only the stochastic ('savb') solver. Maximum number of mini-batch passes, specified as the comma-separated pair consisting of 'MiniBatchLimit' and a positive integer. If you specify 'MiniBatchLimit' but not 'DataPassLimit', then fitlda ignores the default value of 'DataPassLimit'. If you specify both 'MiniBatchLimit' and 'DataPassLimit', then fitlda uses the argument that results in processing the fewest observations. The default value is ceil(numDocuments/MiniBatchSize), where numDocuments is the number of input documents. Mini-batch size, specified as the comma-separated pair consisting of 'MiniBatchLimit' and a positive integer. The function processes MiniBatchSize documents in each iteration. Learning rate decay, specified as the comma-separated pair 'LearnRateDecay' and a positive scalar less than or equal to 1. For mini-batch t, the function sets the learning rate to η(t)=1/(1+t)κ, where κ is the learning rate decay. If LearnRateDecay is close to 1, then the learning rate decays faster and the model learns mostly from the earlier mini-batches. If LearnRateDecay is close to 0, then the learning rate decays slower and the model continues to learn from more mini-batches. For more information, see Stochastic Solver. This option supports the stochastic solver only ('savb'). Validation data to monitor optimization convergence, specified as the comma-separated pair consisting of 'ValidationData' and a bagOfWords object, a bagOfNgrams object, or a sparse matrix of word counts. If the validation data is a matrix, then the data must have the same orientation and the same number of words as the input documents. 0 – Do not display verbose output. 1 – Display progress information. Output LDA model, returned as an ldaModel object. A latent Dirichlet allocation (LDA) model is a document topic model which discovers underlying topics in a collection of documents and infers word probabilities in topics. LDA models a collection of D documents as topic mixtures θ1,…,θD, over K topics characterized by vectors of word probabilities φ1,…,φK. The model assumes that the topic mixtures θ1,…,θD, and the topics φ1,…,φK follow a Dirichlet distribution with concentration parameters α and β respectively. The topic mixtures θ1,…,θD are probability vectors of length K, where K is the number of topics. The entry θdi is the probability of topic i appearing in the dth document. The topic mixtures correspond to the rows of the DocumentTopicProbabilities property of the ldaModel object. The topics φ1,…,φK are probability vectors of length V, where V is the number of words in the vocabulary. The entry φiv corresponds to the probability of the vth word of the vocabulary appearing in the ith topic. The topics φ1,…,φK correspond to the columns of the TopicWordProbabilities property of the ldaModel object. 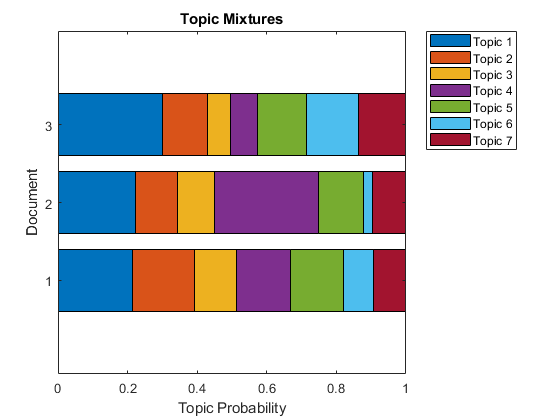 Sample a topic mixture θ~Dirichlet(α). The random variable θ is a probability vector of length K, where K is the number of topics. Sample a topic index z~Categorical(θ). The random variable z is an integer from 1 through K, where K is the number of topics. Sample a word w~Categorical(φz). The random variable w is an integer from 1 through V, where V is the number of words in the vocabulary, and represents the corresponding word in the vocabulary. The following diagram illustrates the LDA model as a probabilistic graphical model. Shaded nodes are observed variables, unshaded nodes are latent variables, nodes without outlines are the model parameters. The arrows highlight dependencies between random variables and the plates indicate repeated nodes. A special case of the Dirichlet distribution is the symmetric Dirichlet distribution. The symmetric Dirichlet distribution is characterized by the concentration parameter α, where all the elements of α are the same. The stochastic solver processes documents in mini-batches. It updates the per-topic word probabilities using a weighted sum of the probabilities calculated from each mini-batch, and the probabilities from all previous mini-batches. For mini-batch t, the solver sets the learning rate to η(t)=1/(1+t)κ, where κ is the learning rate decay. where Φ(t*) is the matrix learned from mini-batch t, and Φ(t−1) is the matrix learned from mini-batches 1 through t-1. Before learning begins (when t = 0), the function initializes the initial word probabilities per topic with random values. Starting in R2018b, fitlda, by default, sorts the topics in descending order of the topic probabilities of the input document set. This behavior makes it easier to find the topics with the highest probabilities. In previous versions, fitlda does not change the topic order. To reproduce the behavior, set the 'TopicOrder' option to 'unordered'. Foulds, James, Levi Boyles, Christopher DuBois, Padhraic Smyth, and Max Welling. 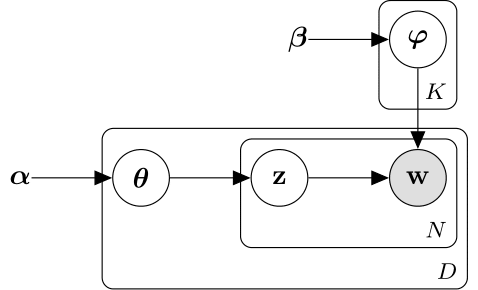 "Stochastic collapsed variational Bayesian inference for latent Dirichlet allocation." In Proceedings of the 19th ACM SIGKDD international conference on Knowledge discovery and data mining, pp. 446–454. ACM, 2013. Hoffman, Matthew D., David M. Blei, Chong Wang, and John Paisley. "Stochastic variational inference." The Journal of Machine Learning Research 14, no. 1 (2013): 1303–1347. Griffiths, Thomas L., and Mark Steyvers. "Finding scientific topics." Proceedings of the National academy of Sciences 101, no. suppl 1 (2004): 5228–5235. Asuncion, Arthur, Max Welling, Padhraic Smyth, and Yee Whye Teh. "On smoothing and inference for topic models." In Proceedings of the Twenty-Fifth Conference on Uncertainty in Artificial Intelligence, pp. 27–34. AUAI Press, 2009. Teh, Yee W., David Newman, and Max Welling. "A collapsed variational Bayesian inference algorithm for latent Dirichlet allocation." In Advances in neural information processing systems, pp. 1353–1360. 2007.